Here at Groundworks we truly specialize in palm trees. Where others may sell a few varieties along with a bunch of other stuff, we are dedicated to palms and have been doing what we do since 1986. Groundworks specializes in variety certified Medjool Date Palms and Mature Specimen field located Canary Island Date Palms. 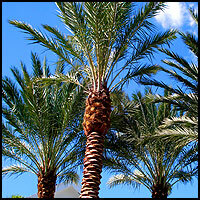 Our high quality Date Palms can be shipped anywhere in the United States where the local climate supports their use. If you have a need for competitively priced Medjool Date Palms or Canary Island Date Palms our quality and swift service are sure to satisfy. 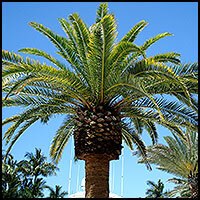 Massive and imposing, the Canary Island date palm is the center of attention wherever it is planted. If you want to make a dramatic statement use this huge imposing palm wherever there is space to accomodate it. Thick canopy of silvery green to dark green. Fronds tend to arch out and downward creating a more tropical look then with other varieties. This is a spectacular palm for landscaping large areas. Where Zahidis are installed, they tend to blow away everything else in sight. As natural attention getters, you cannot go wrong with these awesome specimens. The attractive little European fan palm has become very popular in recent years, mostly due to its cold hardiness. Beauty, ruggedness, versatility, cold hardiness and drought resistance add up to make Chamaerops humilis a winner. This is a cold hardy palm that is very easy to grow. This beautiful feather palm has long pinnate leaves that arch and recurve towards the ground from atop a thick stout trunk. 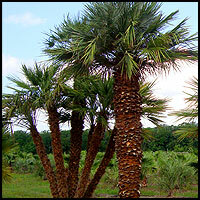 The Sylvester Date Palm is one of the most popular palm trees in the world. This spectacular palm is often used throughout luxury homes, renowned golf courses or for avenue planting. This massive tropical palm commands attention and inspires awe wherever it is grown. The Bismarck palm's stout trunk and symmetry of the huge crown lends a formal note. This attractive clumping palm punctuates the flat horizon of the Everglades across South Florida. The Everglades palm can be seen growing in great mounds that erupt from the edges of the small islands that dot this "river of grass". These slow-growing erect fan palms are crowned with dark, glossy green leaves plaited like a fan. They are salt, frost and wind tolerant and look gorgeous with a classic cut trunk. Tall and slender this palm is a graceful beauty. The symmetrical crown is nearly spherical and held atop an arrow-straight trunk that will typically reach heights of 30 feet. Sabal Palms are tough and versatile. The trunks are heavy and the canopies dark green. This stately palm likes wet feet and can be used where so many other varieties will fail due to inundated conditions. Saribus is one of the most unique and alluring of the cold hardy palms we offer. This is a totally unique multi or single stem fan palm that produces large, deep green fronds and heavy trunks. A cross between two species of palms, Washingtonia filifera and Washingtonia robusta, the “filibusta” is thought by many in the landscape industry to be a superior hybrid. Stately and distinctive, the California fan palm is one of the most widely grown palms in subtropical climates. The California fan palm has numerous fine attributes including cold hardiness, fast growth and drought and salt resistance. Soaring to over 100 ft (30.5 m), this skyscraper of the palm world is a striking sight when planted at equal intervals along a boulevard or when snuggled up in groups against high rise buildings. Windmill palm is one of the most cold hardy palms available. It is beautifully compact and grows to heights of 20-40 ft. This palm makes a great accent which fits well into small areas like courtyards and entries. Copyright © 1999-2019 Groundworks, All Rights Reserved.